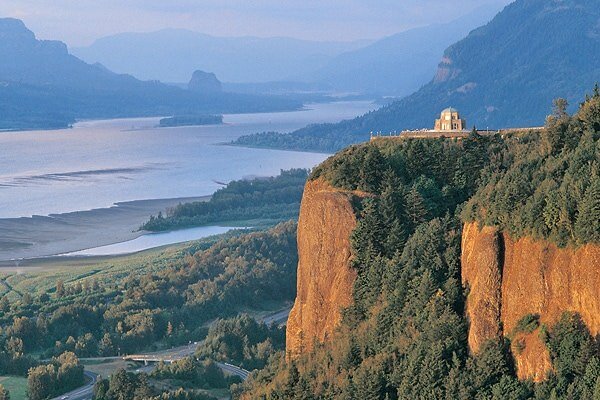 Slip away from city life and escape to the Columbia River Gorge. 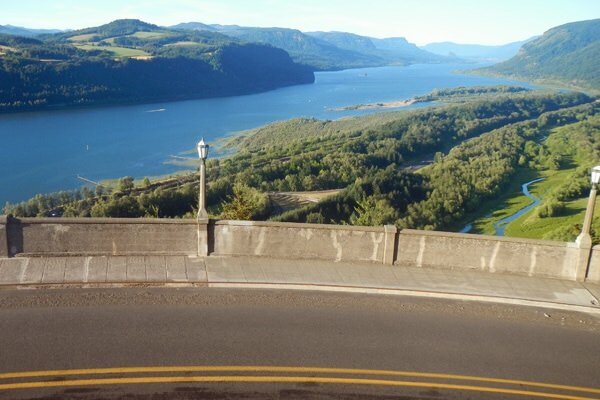 The Historic Columbia River Highway begins (or ends, depending on your direction) on the outskirts of Greater Portland in the charming town of Troutdale (B1), known as the “Gateway to the Gorge.” Browse stores and galleries downtown, eat meals from vintage cookbooks and stroll the grounds of McMenamins Edgefield. In true centennial spirit, you can locate the new bronze statues of the historic highway’s visionaries, Samuel Lancaster and Sam Hill, in Troutdale’s Visionary Park. As you continue down the highway, find a safe place to park and take pictures of a Historic Route 30 sign (N1) and a National Scenic Area sign (I2). 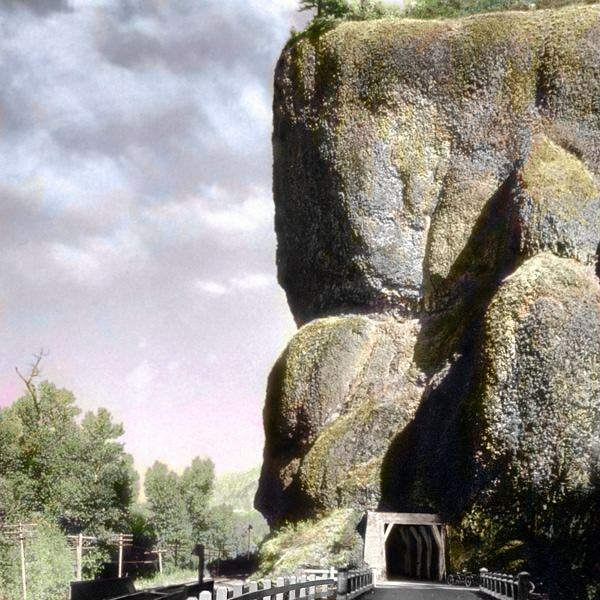 Soon enough, you’ll arrive at the Portland Women’s Forum State Scenic Viewpoint (B4), where you can snap a selfie with the Sam Hill Memorial Rock (I1) and the Chanticleer Inn (N5). 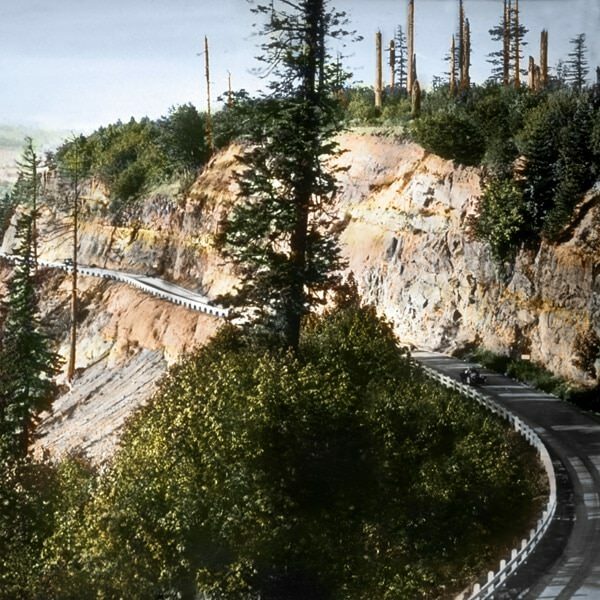 From here, enjoy a view of the highest point (I4) on the route, where the highway intersects with Larch Mountain Road. 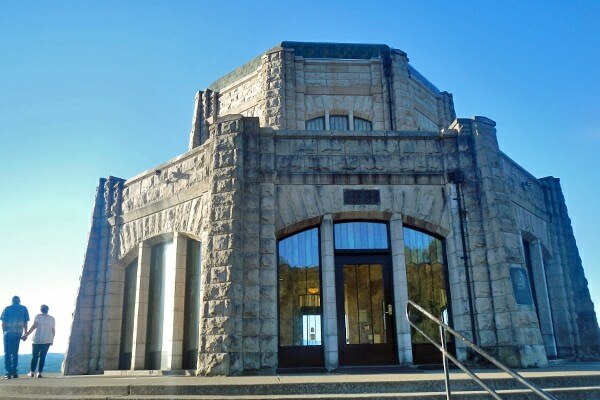 Vista House at Crown Point is jokingly known as the “Million-Dollar Outhouse” (B2) because it was built in 1918 due to the lack of public restrooms along the highway. With an unique architectural design, stained glass windows and a museum in the basement, Vista House may be the highway’s prettiest rest stop too. Crown Point itself is nicknamed “Thor’s Heights” (G2) for being one of the most prominent (and windy!) viewpoints in the Gorge. Relish in this picture-worthy location. As you leave, drive slowly on the Crown Point Figure-Eight Loops (O5), where the highway curves five times. 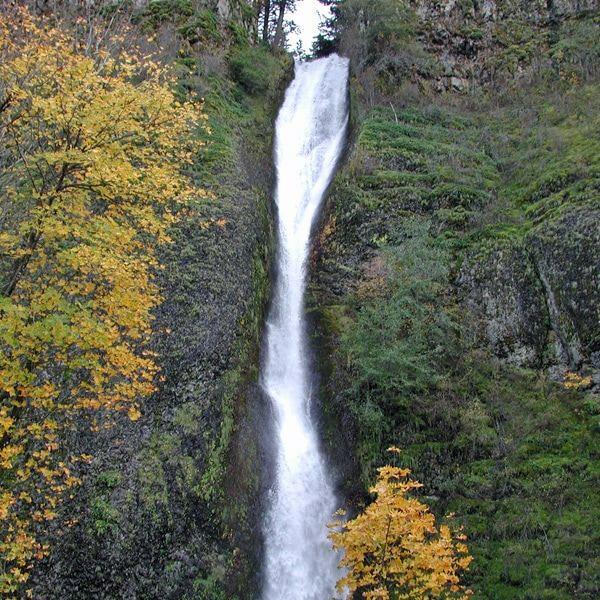 Before you know it, your journey will take you to Oregon’s majestic “Waterfall Alley,” a close series of breathtaking waterfalls and hikes. 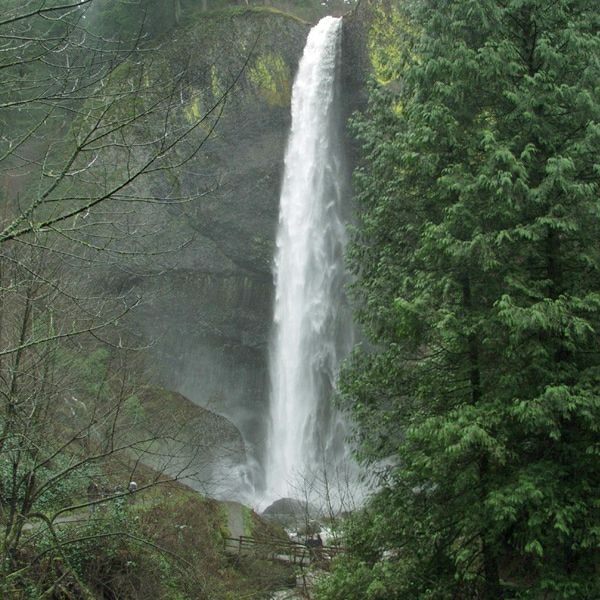 You can visit all eight — Latourell Falls, Shepperd’s Dell, Bridal Veil Falls, Multnomah Falls, Oneonta Falls, Horsetail Falls, Wahclella Falls and Punchbowl Falls — and easily fill up your camera’s memory card. 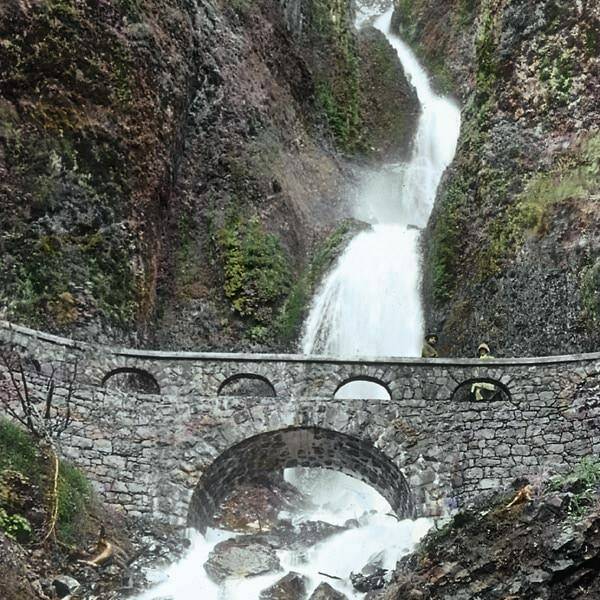 But for Historic Highway Bingo, you’ll want to look out for the Latourell Bridge (B5), Latourell Falls lichen (G1), Shepperd’s Dell Bridge and Falls (I3), Bridal Veil Falls (O4), Simon Benson’s plaque at Wahkeena Falls (I3), the Rotary Wheel at Wahkeena (G5), Oneonta Tunnel (O2) and Horsetail Falls (N2). Still playing? Earn squares for general spots along the highway, such as a beauty shot (N3), white guardrail (O1), an original rock wall (G3), fern (O3), an out-of-state license plate (N4), water fountain (G4) and yellow striping on the road (I5). Now take it all in. You’ve seen a lot. Rest your feet at Ainsworth State Park, then find local lodging to spend the night. Tomorrow is another adventure.